The Deadly Consequences To Children Of Yemen's War : The Two-Way Hundreds of kids have been killed in the violence. And a new UNICEF report suggests that many times more children died because of the near-collapse of the country's health system. 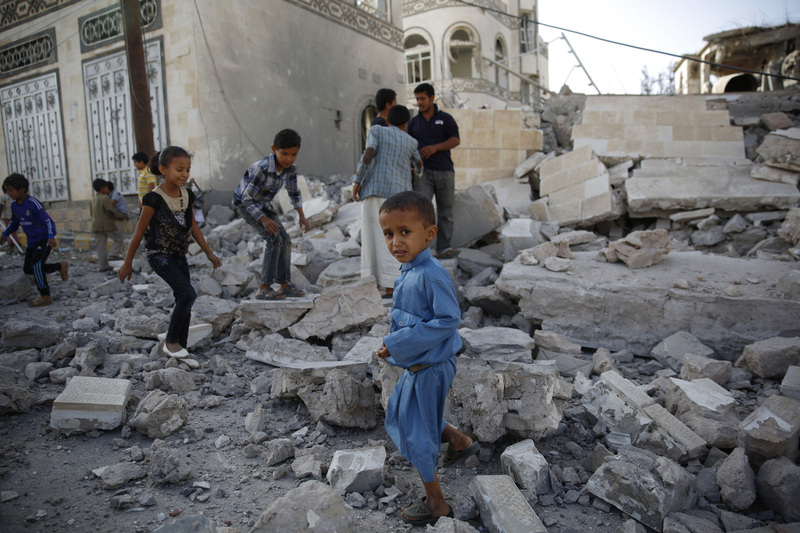 Children play amid the rubble of a house destroyed by a 2015 Saudi-led airstrike in Yemen's capital Sanaa. Just over a year ago, a Saudi-led coalition started a major offensive in Yemen in support of the country's embattled President Abd Rabbo Mansour Hadi. The coalition airstrikes are aimed at pushing back the Shiite Houthi rebels, who swept down from northern Yemen in 2014 and took control of major portions of the country. But it's not just two warring sides – southern separatists and powerful tribes also have a stake in the fight. And an al-Qaida branch and a burgeoning ISIS affiliate have benefited from the violence. And Yemen's civilians have been caught in the middle with disastrous consequences. "The infrastructure, the health structure, the education structure and, in many ways, more importantly, the social structure have just been devastated," former U.S ambassador to Yemen Barbara Bodine told NPR's Michele Kelemen. UNICEF has released a new report detailing the impact of the war on the 11.5 million children in the region's poorest country. Hundreds of kids have been killed in the violence. And according to the report, many times more children died because of the near-collapse of the country's health system. At least 6: Number of children killed or maimed daily. 934: Number of children killed during the past year as a result of "grave violations." One thousand three hundred fifty six were injured. And UNICEF says 61 percent of these casualties were caused by Saudi-led coalition airstrikes, Lisa Schlein reported to our Newscast unit. 10,000: Approximate number of children under five years old who died over the past year "from preventable diseases as a result of the decline in key health services such as immunization against vaccine preventable diseases and the treatment of diarrhoea and pneumonia." 848: U.N.-documented cases of child recruitment for the fighting. 51: U.N.-documented cases of attacks on education facilities. 10.2 million: Children at risk of "going without safe drinking water and sanitation." More than 1.8 million: Number of children "forced out of school" because of the violence. 1,600: Schools that are closed because of the fighting. As Michele reported, U.N. envoy Ismail Ould Cheikh Ahmed is "hoping for a nationwide cease-fire by April 10." "Since the Saudis entered the war and fighting intensified, more than 3,000 civilians have been killed. The United Nations has an ambitious timeline to start winding down this conflict and begin political talks in mid-April." Ahmed was clear about the urgency: "If we fail this time, this probably one of our last chance to get an end to this war," Ahmed said. "This is really our last chance." Multiple previous ceasefire attempts have collapsed within minutes.